Lately I’ve been rocking it old school with some high-quality retro-hip products from Woody’s Quality Grooming. If you haven’t heard of Woody’s, I would recommend checking them out. Woody’s Quality Grooming gives a nod to the old school grooming styles of the classic American male while updating them with today’s grooming technology. All of these products smell great and perform in a no-fuss kind of way — easy, clean and masculine. A couple of my must-haves are the Meat and Potatoes Bar and the Foaming Shave Gel. 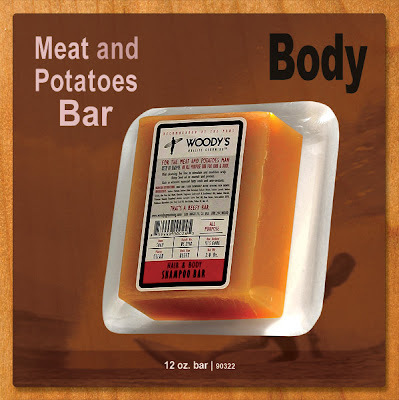 Meat and Potatoes Bar is a simple solution for hair and body maintenance. This is a natural vegetable based bar with super mild and effective cleansers and conditioners — hemp seed oil, tea tree, and shea butter. It has excellent foaming action, rinses off easily and leaves my skin soft as a supermodels bottom. And for some extra charm, it’s packaged like a pound of beef — yes, the same packaging that you might see at Trader Joe’s. The Foaming Shave Gel is another winner. It’s slick without being dangerous and has just the right amount of foam that allows you to see where you’ve shaved without looking like Santa. Clean and close. I've been getting a nick-free shave with this one. Woody’s Quality Grooming also has a celebrity following. They've helped primp GlamMen like Eric Bana, Benjamin Bratt, Dermot Mulroney, Ben Stiller and Robert Downey Jr. Check out the whole Woody’s Quality Grooming line out at www.woodysgrooming.com.